The Badhai name comes from the Sanskrit vardhna which means 'cutting'. The Badhais believe that their name comes from Lord Vishwakarma who created two people groups: the cutters of wood, or Badhai people and the workers of iron, or Lohar people. 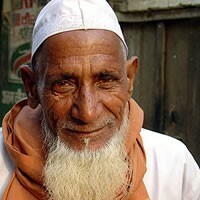 Of the more than 6 million Badhai in South Asia about 10 percent (or 600,000) are Muslims. 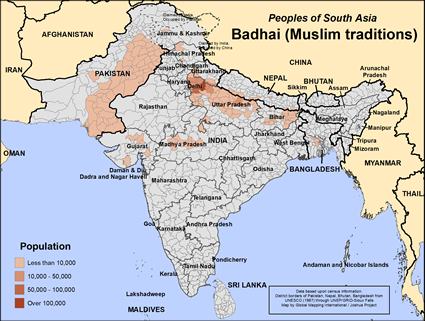 Most of those Badhai Muslims live in Uttar Pradesh but others are scattered through north India, Nepal and Pakistan. As mentioned above the Badhai are traditionally wood-cutters and carpenters. Today carpentry is still common though some have acquired land and are involved in agriculture. The men have a custom of wearing the dhoti, a baniyan shirt and a red cloth, or gamcha, over the shoulder. They are not vegetarian and prefer rice and wheat as staple grains. The small Badhai population in Nepal that are found mainly in Rapti, Bheri and Sagarmatha zones are primarily Nepali speaking but also use Urdu, Bhojpuri and Maithili. Though most Badhai are Hindus the smaller Nepali Badhai are nearly all Sunni Muslims. From the carpentry origins, lets pray that Jesus, the prophet and carpenter, can be proclaimed in this lost community of Muslims. There are no known believers among this group. May woodworking Christians and other believers gain a burden for this group of people! View Badhai (Muslim traditions) in all countries.